Court rules on condo lien deadlines BY ALEX ROBINSON Law Times T he Ontario Court of Ap- peal has confirmed that the 90-day deadline for condominium corpora- tions to register liens applies when a unit owner fails to pay costs in compliance orders. In CIBC Mortgages Inc. v. York Condominium Corpora- tion No. 385, the Court of Appeal determined that a bank's mortgage had priority over a condominium corporation's lien, as it failed to perfect it according to the Condo- minium Act. 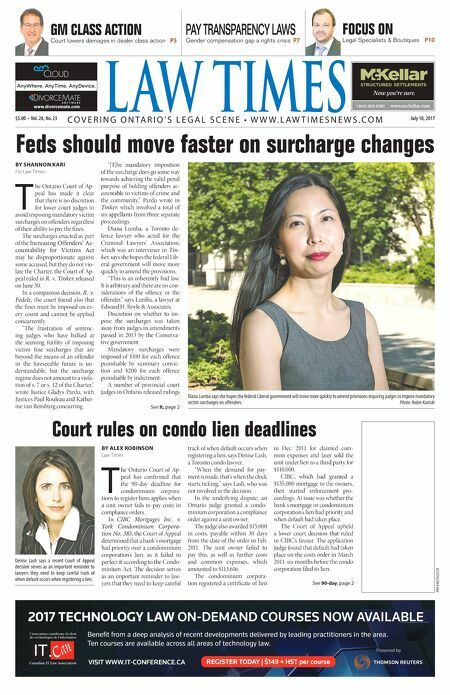 The decision serves as an important reminder to law- yers that they need to keep careful track of when default occurs when registering a lien, says Denise Lash, a Toronto condo lawyer. "When the demand for pay- ment is made, that's when the clock starts ticking," says Lash, who was not involved in the decision. In the underlying dispute, an Ontario judge granted a condo- minium corporation a compliance order against a unit owner. The judge also awarded $15,000 in costs, payable within 30 days from the date of the order in Feb. 2011. The unit owner failed to pay this, as well as further costs and common expenses, which amounted to $113,616. The condominium corpora- tion registered a certificate of lien in Dec. 2011 for claimed com- mon expenses and later sold the unit under lien to a third party for $110,000. CIBC, which had granted a $135,000 mortgage to the owners, then started enforcement pro- ceedings. At issue was whether the bank's mortgage or condominium corporation's lien had priority and when default had taken place. The Court of Appeal upheld a lower court decision that ruled in CIBC's favour. The application judge found that default had taken place on the costs order in March 2011, six months before the condo corporation filed its lien. PAY TRANSPARENCY LAWS Gender compensation gap a rights crisis P7 FOCUS ON Legal Specialists & Boutiques P10 See 90-day, page 2 PM #40762529 $5.00 • Vol. 28, No. 23 July 10, 2017 L AW TIMES C O V E R I N G O N T A R I O ' S L E G A L S C E N E • W W W . L A W T I M E S N E W S . C O M GM CLASS ACTION Court lowers damages in dealer class action P5 BY SHANNON KARI For Law Times T he Ontario Court of Ap- peal has made it clear that there is no discretion for lower court judges to avoid imposing mandatory victim surcharges on offenders regardless of their ability to pay the fines. The surcharges enacted as part of the Increasing Offenders' Ac- countability for Victims Act may be disproportionate against some accused, but they do not vio- late the Charter, the Court of Ap- peal ruled in R. v. Tinker, released on June 30. In a companion decision, R. v. Fedele, the court found also that the fines must be imposed on ev- ery count and cannot be applied concurrently. "The frustration of sentenc- ing judges who have balked at the seeming futility of imposing victim fine surcharges that are beyond the means of an offender in the foreseeable future is un- derstandable, but the surcharge regime does not amount to a viola- tion of s. 7 or s. 12 of the Charter," wrote Justice Gladys Pardu, with Justices Paul Rouleau and Kather- ine van Rensburg concurring. "[T]he mandatory imposition of the surcharge does go some way towards achieving the valid penal purpose of holding offenders ac- countable to victims of crime and the community," Pardu wrote in Tinker, which involved a total of six appellants from three separate proceedings. Diana Lumba, a Toronto de- fence lawyer who acted for the Criminal Lawyers' Association, which was an intervener in Tin- ker, says she hopes the federal Lib- eral government will move more quickly to amend the provisions. "This is an inherently bad law. It is arbitrary and there are no con- siderations of the offence or the offender," says Lumba, a lawyer at Edward H. Royle & Associates. Discretion on whether to im- pose the surcharges was taken away from judges in amendments passed in 2013 by the Conserva- tive government. Mandatory surcharges were imposed of $100 for each offence punishable by summary convic- tion and $200 for each offence punishable by indictment. A number of provincial court judges in Ontario released rulings See It, page 2 Diana Lumba says she hopes the federal Liberal government will move more quickly to amend provisions requiring judges to impose mandatory victim surcharges on offenders. Photo: Robin Kuniski Feds should move faster on surcharge changes & $#&!&jmmm$cYa[bbWh$Yec ntitled-4 1 12-03-20 10:44 AM 2017 TECHNOLOGY LAW ON-DEMAND COURSES NOW AVAILABLE Benefit from a deep analysis of recent developments delivered by leading practitioners in the area. Ten courses are available across all areas of technology law. Powered by REGISTER TODAY | $149 + HST per course VISIT WWW.IT-CONFERENCE.CA Untitled-1 1 2017-07-05 3:00 PM AnyWhere. AnyTime. AnyDevice. www.divorcemate.com vorceMate-Earlug_LT_July10_17.indd 1 2017-07-07 11:56 AM Denise Lash says a recent Court of Appeal decision serves as an important reminder to lawyers they need to keep careful track of when default occurs when registering a lien.